Today is an auspicious day, Chinese across the globe are making tang yuan or glutinous rice balls to celebrate 冬节 or Winter Solstice. Many believe the Winter Solstice or 冬节 is much more auspicious and important than the Lunar Chinese New Year. The traditional tang yuan is cooked in ginger syrup without filling. 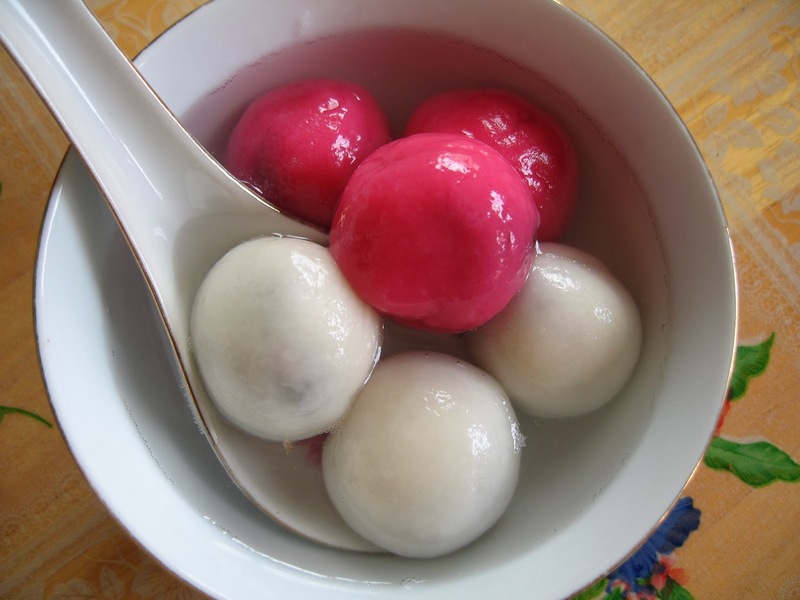 Over the years, creativity set in and the original version of plain tang yuan had evolved into balls of glutinous rice stuffed with all kinds of tasty fillings. The more common and popular fillings being red bean paste, yam paste, sesame paste and peanuts. With or without the fillings, tang yuan tastes great in the ginger infused syrup. It is a great dessert, usually taken hot or warm. When we were young, our elders used to tell us that we have to eat the same numbers of tang yuan equivalent to our age. Back then our young minds would be thinking "oh my gosh! grandpa would have to eat seventy tang yuan!" However, we caught on fast and pretty soon we knew grandpa was just pulling our legs! According to the Chinese method of calculating age, the moment you eat tang yuan on that particular day, you would have just added one year to your age. Like most Chinese, we are celebrating this auspicious day and I am happy to share our family's version of the tang yuan. 1. Place the glutinous rice flour into a large bowl. 2. Add hot boiling water to the flour and use a spoon to mix he flour and water. When it has cool down sufficiently to handle, use hands to knead this mixture to form a soft dough. 3. Add more hot water if the flour cannot bind. 4. Or add more glutinous rice flour if the dough is too sticky to handle. 5. Divide the dough into 10 equal portions. 6. Roll each portion into a small disk and wrap the dough round a ball of red bean paste to form a white ball. 7. Repeat the process with the remaining ingredients. 8. Set aside the white tang yuan. 2. Add red food colouring into the boiling water. Then add the hot boiling water to the flour and use a spoon to mix the flour and water. When it has cool down sufficiently to handle, use hands to knead this mixture to form a soft dough. 6. 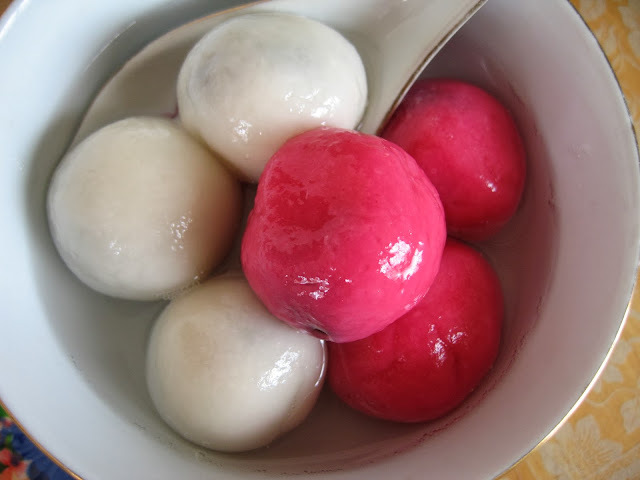 Roll each portion into a small disk and wrap the dough round a ball of red bean paste to form a pink ball. 7. Repeat process with the remaining ingredients. 8. 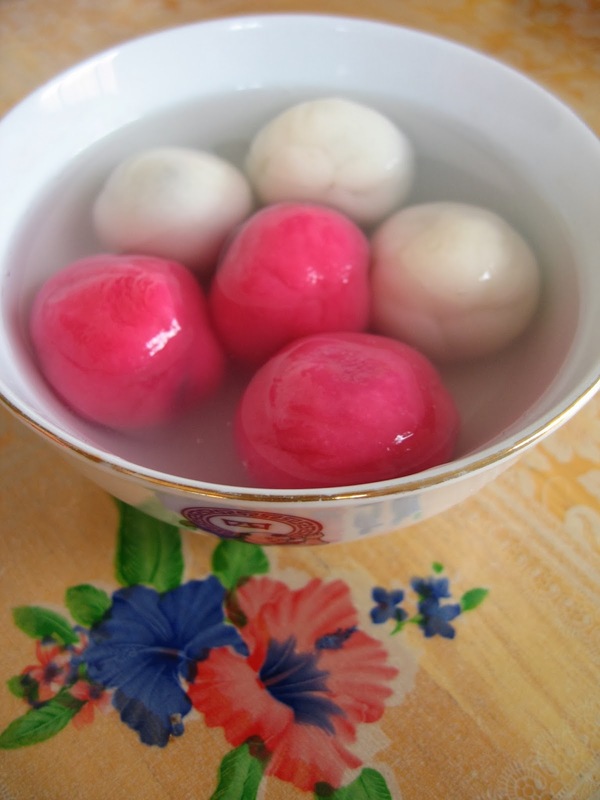 Set aside the pink tang yuan. 1. Bring all the ingredients to a boil until the rock sugar dissolves. 2. Set aside and keep warm..
2. 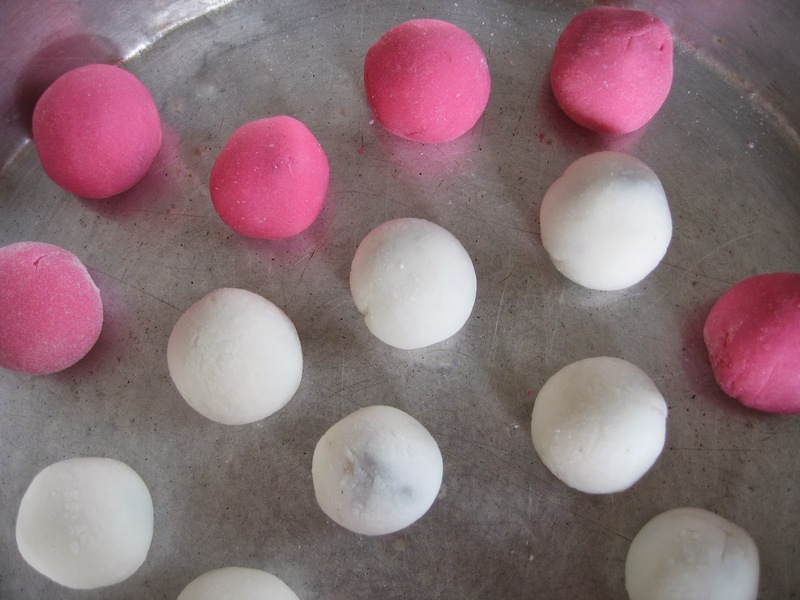 When boiling, add balls of white tang yuan and red tang yuan into the boiling water. 3. The tang yuan will float to the surface once it is cooked. 4. Use a slotted spoon to remove the cooked tang yuan and place into bowls. 5. Add syrup to the bowls of tang yuan.